This was one of those books that I bought for 1.99, not really knowing what it was going to be about but willing to give it a chance. Partly because it seemed ludicrous, because of the blind boy on the cover and the title, and partly because a couple of years ago I bought a really good fairy tale in the same place, and the cover was somewhat similar in colour. Association, you whore. 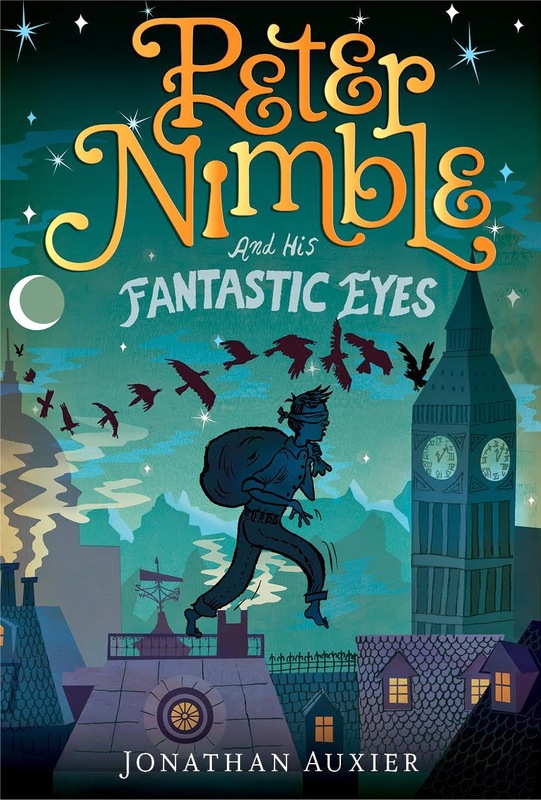 Peter Nimble and His Fantastic Eyes is a fantasy/fairy tale about an orphan boy (again? Yes, again, hello stereotype) who grows up in a quiet harbour town. He’s blind, and the author Jonathan Auxier uses that to heighten all his other senses. It’s a bit odd reading from Peter’s perspective, because you lose an important way to describe things; you don’t get to imagine colours or facial expressions and such. And at times it irked me, but I was still impressed that the author managed to pull it off. Because of his heightened senses and his orphan status, he quickly becomes the best thief ever. He’s only ten years old in the story, so his fingers are still small enough to open every lock. And one day he steals a peculiar chest with three pairs of eyes. The first transport him to- where? Well, I’m not telling you, but it definitely is somewhere fantastic. And in this fantastic place he meets his future sidekick and also one of the biggest plusses in this novel. It’s a knight. Well, he’s 1/3 knight. He’s also 1/3 cat and 1/3 horse. Basically, he’s adorable. Peter Nimble is a good read and I had fun reading it, but it can’t compare to other modern fairy tales. I’m thinking about Neil Gaiman’s Stardust and Michael Gruber’s The Witch’s Boy. If you do decide to be interested in fairy tales, this is a nice book to start with. One more thing though; the writer dares to kill a few characters, and for that, I do admire him.